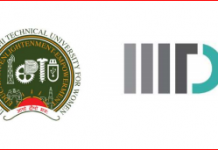 JEE Mains April 2019 Registration Process last date is 07 March 2019. Candidates who wish to appear for the examination must visit the website, register themselves as soon as the registration goes live. Exam dates are announced by the National Testing Agency. Also, JEE Main is one of the most prestigious national level engineering entrance examination. And Lakhs of student work hard throughout the year to crack this exam. Moreover, the last date for registration for JEE Main 2019 April Exam is 07 March 2019 and to submit the application fee is 08 March 2019. Also, the candidates need to apply only online as per the below-described procedure. In this session, NTA is the JEE MAIN conducting authority succeeded by CBSE. The JEE Main will be conducted twice in the year and registration process for January 2019 and April 2019 is described below. 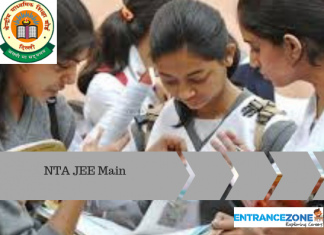 Joint Entrance Examination (JEE) Main is organised by the National Testing Agency (NTA) from 2019 onwards. This National Level Engineering Entrance Examination was being conducted by the Central Board of Secondary Education (CBSE) till 2018. How to register for JEE Main 2019 Exam April Session? Registration for JEE Main April Session bas been started from 08 February 2019. National Testing Agency (NTA) has notified that the Aadhaar number issued by UIDAI (12 digit identification number) is not mandatory for JEE Main 2018 examination registration. NTA JEE Main April 2019 last date for registration is 07 March 2019. From 2019, JEE MAIN exam will be held twice in a year i.e. January & April. National Testing Agency (NTA) is the official authority from 2019 onwards for conducting JEE MAIN. 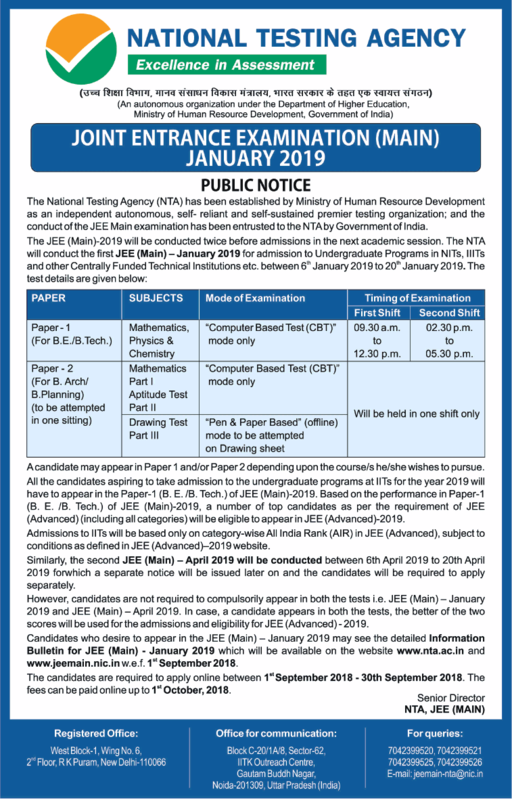 The registration dates for JEE Main 2019 January and April examination is given below. The Online JEE Main Application Form 2019 Submission Process by National Testing Agency is given below. Firstly, applicants have to fill the required details in the online IIT JEE Main application form. Then, applicants need to upload a passport size photo (jpeg format) in the second step. Also, the candidate has to upload signature and thumb impression with recommended size as specified in the information booklet. After submission of all the particulars, an acknowledgement page with application number will appear on the screen. The applicants must take a print of this Acknowledgment Page and keep it safe for future reference. Moreover, the candidates should not send the acknowledgement page or any other document to JEE (Main) Secretariat. Finally, the applicant has to pay the Application form fee. Further, without the successful fee submission, the application form will be considered incomplete. On the other hand, JEE Main 2019 registration or application fee can be paid through two methods-online and offline. On the other hand, there are two methods, i.e. offline and online to pay the registration fees. By depositing fee in cash in Syndicate Bank / Canara Bank / ICICI Bank / HDFC Bank through E-Challan generated during online application form. National Testing Agency official website for JEE Main Registration: www.nta.ac.in. Aadhar Number is not- Mandatory for registering at Joint Entrance Examination. Go to the table below for a complete detailed glance at the registration process. NationalityIndian/OCI/PIO/foreign state of EligibilityState from where the candidate has passed/appearing in class XII or equivalent examination or state mentioned in the Passport. State from where the candidate has passed/appearing in class XII or equivalent examination. State mentioned in the Passport. Aadhaar Number, Aadhaar Enrolment ID, Aadhaar Registration number, Passport Number, Ration Card Number, Bank Account Number, any other valid Government ID Number. Candidate’s Name As per Aadhaar. Choice of Examination Centre (any four) As per list of Examination cities, Question Paper medium English/Hindi/Gujarati. Mother’s name maximum 46 CharacterFather’s name maximum 46 Character. CategoryGeneral/SC/ST/OBC-NCL (Central List) State list OBC Candidates who are not in OBC – NCL central list must choose General. State admission boards shall verify the State OBC list separately. The person with Disability (PWD)Yes/No If PWD, mention the percentage of disability? Complete Mailing Address Pin code of the mailing address. Year of Passing Class 10th or its Equivalent 2001-2015. Place of 12th class schooling Village/Town/City. Year of Passing or Appearing Class 12th/Qualifying Examination 2015/2016/2017. School Board of Class 12th/Qualifying examinations per the list of Boards. Roll Number of Class 12th/Qualifying Examination (if allotted). Whether appearing for improvement examination of class 12th in all subjectsYes/No. If, yes, Roll Number of improvement Examination (if allotted). Name of the Qualifying Examination passed/appearing. Type of Institution of Class 12th/Qualifying Examination Government/private. 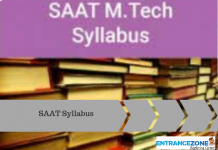 Mode of Preparation Self-Study/IndividualTuition/Coaching/Correspondence Courses/OthersName & Address of the School/College from where passed/appearing. Landline no. with STD code or any other contact no. Illiterate/Matriculate/Graduate/Post Graduate/OthersMother’s OccupationAgriculture/Business/Medical/Engineering/Law Practice/Government Service/Public Sector Service/ Private Service/Teaching or Research/Architecture/Pharmacy/Self Employment/Others (including Housewife). Declaration by the candidate hereby declares that all the particulars stated in this application form are true to the best of my knowledge and belief. I have read and understood the JEE procedures for both JEE (Main)-2017 and JEE(Advanced)-2017. I shall abide by the terms and conditions thereon. Mark Sheet for Class 12th – Firstly only required for the candidate who has recently passed the 12th exams. Moreover, candidates who are appearing will need to provide it later during counselling. Applicants Valid Email and Valid Mobile Number. Applicant Passport Size Photograph in JPEG format. Note: Debit/Credit Cards or Net Banking facility is required if an applicant is going to make payment online for the Online Registration process at www.jeemain.nic.in. Date of Birth Certificate OR an applicant may use 10th Class marks sheet as Date of birth evidence. Xth Class Certificate for reference. Email address of the applicant. The CBSE opened the JEE Main Application Form Correction, The correction window was open @jeemain.nic.in from 08 October 2018. The applicants who wanted to review or upload new images could have logged on to the official website with login credential and security question. 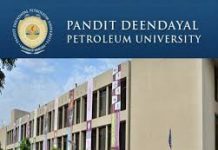 Important Instruction: The candidates are suggested to read the instructions on the admit card carefully and follow them during the conduct of the examination. “Stay tuned to EntranceZone for Latest updates and feature articles on JEE Main Registration Process 2019″. 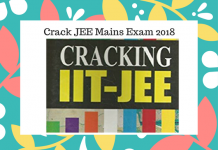 jee mains 2019 registration, jee main registration, jee main exam date 2019, jee main 2019 centres, jee main login, jee mains 2019 application form, jeemain.nic.in login 2019, jee main login password. How many attempts one can give to get admission into IIT? Till when one can fill the JEE MAIN form? What documents are required for JEE Mains 2019 Registration? As CBSE is not going to conduct the examination this year and National Testing Agency (NTA) is autherised to conduct the same. What are latest updates of the NTA JEE Main 2019?